Kat and Karl : are we in mexico? last night we went to the driving range w/ kristen and her husband jr and her brother brady. i sucked it up. the rest of them did well. golfing is totally going to mess up my power swing (sarcasm) for the softball tournament this weekend. 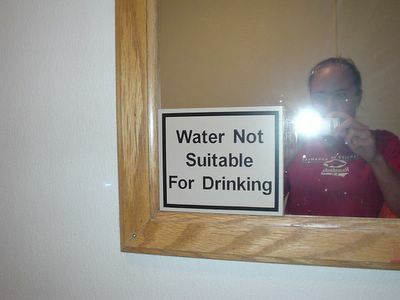 i found this amusing sign in the bathroom at the driving range...hmmm... anyone else confused? i didn't wash my hands! i sent my wedding invitations out yesterday (trust me it was nerve racking! we spent some much time making them and i spent so much time addressing them and then i just put them in this little blue box and they magically make their way across the country to your houses? i felt like the dad sea turtle in finding nemo who lets his 'little man' go!) anyway the invites list our wedding blog address for our guests to look at (esp if they can't make the wedding) so i spent last night fixing that up a bit to. check it out if you have time! it is linked to this page.